Fitting your own worktops may seem like a daunting task, but depending which material you choose to sit atop your solid oak kitchen cabinets, it can either be a straightforward affair with minimal DIY know-how, or a job more suited to a specialist kitchen fitter. There’s no harder surface than a granite worktop, which is a solid stone counter that is available in a wide variety of colours and compositions.. However the unrivalled hardness of these stone surfaces make this a material that is very difficult to fit in a kitchen by all but those with considerable experience. As such nearly all installations will require a specialist fitter. Granite worktops are incredibly heavy – even the smallest worktop sections should be carried by a minimum of two people. To cut granite worktops, an angle grinder of ‘wet’ tile saw will be needed, with water to keep them cool enough to cut through the stone. Drilling through granite will also require water cooling – this can be done by using putty to create a small ‘well’ of water around the point being drilled. A strong bonding agent will be required to attach granite worktops to cabinetry, such as ‘stone silicone’. Care needs to be taken when using sealant as using too much can spoil the look of the cabinetry – both on the inside and outside edges. As Granite is not easily workable using basic tools, an upstand is required on all the straightest of walls, otherwise an uneven wall can leave unsightly gaps between the worktop and the wall. If you are after an affordable worktop that is available in a huge range of finishes, then consider laminate surfaces. These worktops are relatively easy to fit, as laminate worktops usually have a centre constructed of chipboard, and are very easy to cut down to size. Like wooden worktops, a router can be used to route the edges or cut bolt ‘dog bones’ in to the underside of the worktop, but unlike wood, you cannot easily add features such as drainage grooves or an edge profile to the worktop without ruining their look. If you have cut a length of laminate worktop, then you will need to re-finish the edges using edging strip. Some edging strip has its own adhesive, but otherwise a contact adhesive is required to stick the strip firmly onto the counter. Once affixed, the edges of the strip need to be filed down, with special care taken to avoid marking or unnecessarily filing down the worktop itself. Where two worktops are to be joined together, colour-fill joint sealant is required alongside bolts, otherwise the join will not be water tight. To join laminate worktops to cabinetry, it is relatively straight forward – right-angled brackets can be used and screwed directly into the chipboard on the underside of the worktop. In modern kitchens, composite or ‘solid’ surfaces are very popular for a clean, unblemished look. If not fitting a pre-fabricated worktop, this seamless look can be quickly spoilt if you do not have plenty of time and the right tools to hand. Some composite surfaces are made of a specific resin or plastics, whilst others have a 3-10mm solid surface layer bonded to high density fibre board. Depending on the brand of the product, the manufacturer may recommend expert cutting equipment along with specialist glue and a finishing pack. Cutting the worktops themselves is not particularly difficult – a good quality router or jigsaw is capable of doing the job. Joining worktops and achieving a quality finish may be trickier – two worktops are glued together, and to achieve a seamless look, the excess glue will need to be sanded off to an even finish. It is suggested that an orbital sander is best, though these usually require some kind of ventilation as the glue dust can make an awful mess and is often toxic. After sanding, the join will then need polishing to return it to a pleasing finish. To prepare for final sanding, it is recommended that you use several grades of finishing pads or wet/dry sanding. Finally, a suitable polish and pads or electric buffer will create a suitable finish. Composite worktops are a fantastic option for those wanting to imitate a seamless, custom constructed look for a fraction of the usual cost. For a unique natural finish that is hard-wearing, easily worked and aesthetically appealing, wood worktops provide a good balance that makes DIY fitting relatively easy – and as such these are always our choice for our customers. Our collection of kitchen wooden worktops are available in a wide variety of timbers and sizes, with matching plinths available so that you can coordinate your cabinets and worktop material as necessary. Moreover, although pre-fabrication services are available (like those offered by our sister-company: Worktop Express®), hardwood worktops are comparatively easy to make bespoke adjustments to in position. If you are looking for solid wood worktops, we have written a number of guides, including help selecting the right worktop for a modern or traditional kitchen, finding the perfect kitchen colours to compliment your surface and even choosing a wooden worktop for an oak kitchen. A router is the ideal tool to make all manner of adjustments to wooden kitchen worktops, as they are capable of making clean and consistent cuts, but can also be used to route grooves for sink drainage, or to add an aesthetic edge profile to the worktop. To join two worktop sections together, it is recommended that worktop connector bolts are used with ‘dog bone’ or ‘key’ inlays on the underside of the worktop. These inlays can also be cut by a router, or using a more traditional hammer and chisel. To perfect edges on any cuts, you should only require a selection of sandpapers to achieve a smooth finish, and due to the solid nature of wooden worktops, no re-finishing or edge strips are required. In kitchens with uneven walls or unusual features, solid wood worktops can be easily cut to accommodate. As it is a natural product, it can marginally expand and contract with changes in temperature, so it’s often advised to leave an expansion gap between the wall and worktop, which can then be covered with a matching solid wood upstand. To fit the worktops to your kitchen base cabinets, stretcher plates (which allows the wood to expand and contract safely) can be easily screwed into the worktop, and into the cabinets. You shouldn’t need any sealants to safely attach wooden worktops, though they will need to be finished with a coating of oil or lacquer to preserve the hard-wearing qualities of wood. 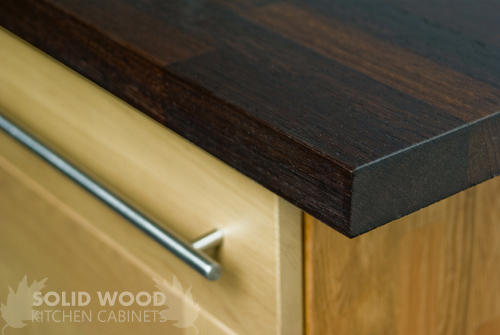 If you require any further information or assistance in fitting worktops to our solid wood cabinets, feel free to get in touch by visiting our Facebook, Twitter or Google+, or contact us via email or telephone. We look forward to helping you!